Commonly, the pitch is known as the slope (incline) of the roof. 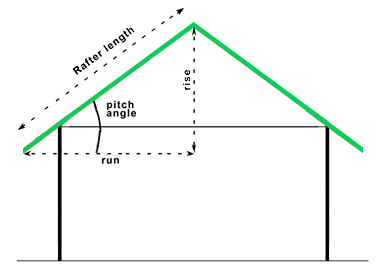 Roof pitch can also be defined as the vertical rise divided by its horizontal span (or run). In construction, the roof pitch can be known as stair while in trigonometry it is known as the tangent function. Pitch is expressed as a degree or percentage in countries that use the metric system while in countries that use imperial measurement, pitch is expressed with rise first and run second. In US, instead of the whole run, 12 inch is used and the pitch is how much rise or fall is for 12 inch of run. All calculations are free to use and we decline any responsibility on the end result. The informations provided by our website are generic and they should not be used for purchasing construction materials - for that please consult a specialist.